The Biosphere Reserve. What does it mean? 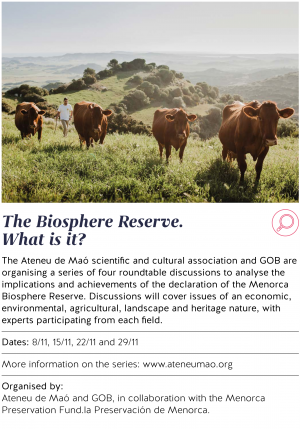 The Ateneu de Maó scientific and cultural association and GOB in collaboration with the Menorca Preservation Fund are organising a series of four roundtable discussions to analyse the implications and achievements of the declaration of the Menorca Biosphere Reserve. Discussions will cover issues of an economic, environmental, agricultural, landscape and heritage nature, with experts participating from each field. ATENEU DE MAÓ, CIENTÍFIC, LITERARI I ARTÍSTIC; The Ateneu de Mahon is a scientific, literary and cultural non-profit organisation founded in 1905 and which carries out events linked to their areas of interest through-out the year. They have over 800 members. 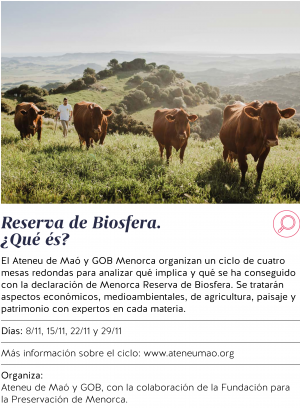 An educational activity looking to increase knowledge around the following key areas: Biosphere Reserve, Countryside, Environmental matters, patrimony, economy and sustainability. 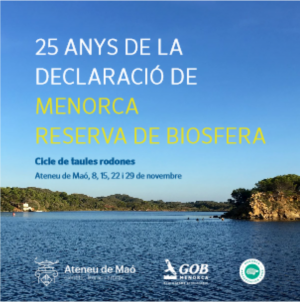 Increase people’s knowledge and understanding of what it means that Menorca is a Biosphere Reserve. To carry out 4 round table events with each focusing on a key topic related to the Biosphere Reserve declaration which has been in place for 25 years, with the objective of raising awareness on the importance of this declaration and what it has meant for the island to have this recognition from UNESCO. Four round table events under the title: Biosphere Reserve – What does it mean? What does the declaration of the Reserve mean and what has it achieved? Joan Rita, professor of the Universidad de las Islas Baleares (UIB). Cipriano Marín, author of the Biosphere Reserve candidacy. Moderator: Carlos Coll, President of GOB Menorca. Tolo Mercadal, director of the Cooperativa del Camp de Menorca. Toni Moll, farmer from La Marcona, a farm with a land stewardship agreement. Enric Picanyol i Roig, owner of an olive oil production farm. Francesc Font, agricultural technical engineer and Son Felip-Algaiarens technical director . Moderator: Deborah Hellyer, businesswoman and former British Consul. Margarita Orfila Pons, archaeology professor (Universidad de Granada). Moderator: Roser Roman, landscape architect. Jorge Fabra, member of the Nuclear Security Council and founder of Economists Facing the Crisis.